We continue Apocalypse Week with “Battlestar Galactica.” “Battlestar Galactica” is one of those shows that I will always come back to I think. The themes of religion, spirituality, history, politics, war and survival are handled so well that every time I watch the series I discover something new. 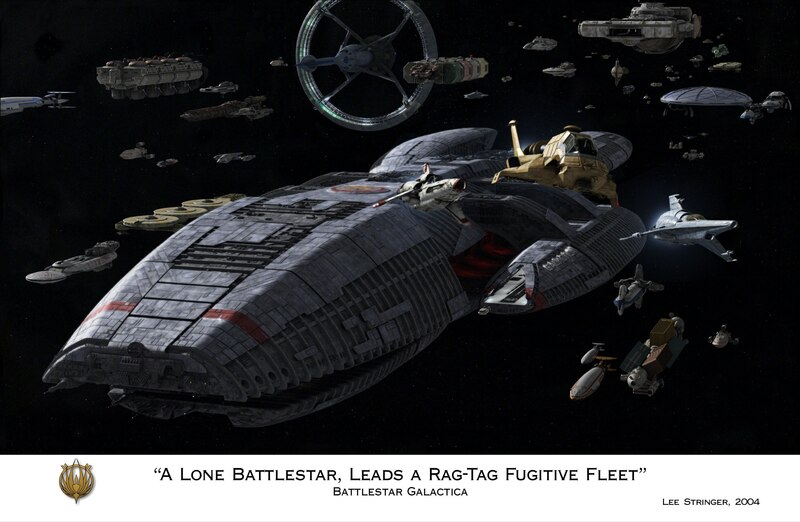 I am of course referring to Ronald Moore’s re-imagining, I have not seen the “Original Battlestar Galactica,” but do plan on it at some point. I still remember the first time I watched this episode and how excited I was at all the possibilities it offered in it’s stories and characters and the reality of the relationships and world it was already exploring. Very few Pilots manage to pull this off. I think what helps was a lot of the themes of religion, war, politics and purpose were explored by Moore in “Star Trek: Deep Space 9” but where DS9 was limited by being public television…there weren’t those limitations on “Battlestar Galactica” for better and for worse he could explore those themes fully. This is done over the Cylons returning to the station and Six (played by Tricia Helfer) kissing the Colonial Representative before the station is destroyed. We then go to the different characters with Admiral Adama retiring the Battlestar Galactica and introduction to the main crew and characters…the main locations being Battlestar Galactica and those coming to Galactica via way of Caprica…the most important characters being Gaius Baltar who invented the security (and gave over the data to a Cylon Six he was sleeping with and didn’t know she was a Cylon) that the Cylons hijacked to destroy the Colonies and Laura Roslin who is the Secretary of Education who finds herself President (and recently learned he had Cancer) when the Cabinet is destroyed on Caprica. From here the story unfolds. Pros: The Music – In this instance the music was largely composed by Richard Gibbs and he does a fantastic job and creating tension with the creating of tension in battle and all the different feelings with the end of the world. The World: Ronald Moore did a great job with his writers creating this world. There are 12 Colonies, 12 Cylons and such a diverse cast of characters from different backgrounds that we barely scratch the surface but are still given so much. We know about the last Cylon War, the silence of the Cylons and that they fear being destroyed again and are reacting as such. We also see the Cylons have an extreme belief in a single God while the Colonists are believe in many Gods. We see the military relationships between the civilians and government via Laura Roslin and the conflict in the military among the military through Lee and his father Admiral Adama and Starbuck and the XO Tigh. We also see the relationships and power dynamics between ships and Cylons a bit too. The Premise: The premise takes the robots and nuclear destruction of humans but does something interesting with it…the robots are given humanity and reasons for what they do and we see conflict among the human factions…which rarely happens in movies that go this route (see “The Terminator Series”). This unique twist and adding religion to the mix with the Cylons being a believer in God adds more depth to a premise that is usually taken as pretty simple. The Action: There are quite a few ship battles and a lot of destruction…from the nuking of Caprica and destroying of civilian vessels by the Cylons…to the battles between Vipers (Colonial) and Raiders (Cylons). It really drives it too since there is so much desperation. Each fight is a literal fight for survival, as humanity is far outmatched. The Colonials – More on what I said above but very brief…the military, civilian and government relationships are really rich in this episode. We see different people and groups reacting to the end of the world and doing what they can to survive or help as many people as they can to survive or to fight. This is the group experiencing the apocalypse and the destruction of their worlds and lives. 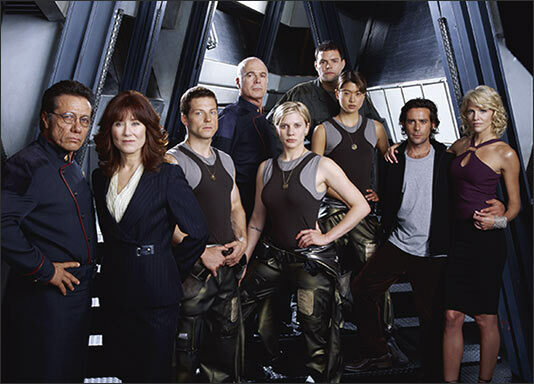 The Cylons – There are 12 Human looking copies and over the course of the episode we meet 4. Spoilers being one of the main characters in the Colonial Fleet is in fact a Cylon. The new Centurions and Raiders look really awesome too. They have a sleek and deadly design. The Characters – The characters and character relationships are the strongest part of this series, besides some of the messages so I’m going to say now that any character who gets exploration…isn’t a dull character. They are really interesting and intriguing and have great dynamics with others. Admiral Adama – Edward James Olmos is one of the greatest actors for a reason. We see it in this with how he is a man dealing with finally having a normal relationship with his divorced wife, his son who died from him pressuring him to join the force and his other son Lee Adama (Apollo) blames him for all of that. He is the heart of the fleet besides Roslin who pulls the people together and fights to defend the human race when he realizes that they’ve lost the war after President Roslin helps him to see. He is the one who gives the lie of Earth to the Fleet to give them hope and reminds them that their lives are worth fighting for, as well as apologizing to Lee in regards to his son and their relationship. Starbuck the rebel fighter pilot is also like a daughter to him, contrasted with the fact that she hates the XO Tigh who is one of Adama’s closest friends. Laura Roslin – Mary McDonnell is wonderful in this role as someone both empathetic and strong. She holds the civilians together and finds survivors to bring to Galactica. She is also the one who reminds Adama that they need government and structure so that the people can be cared for. She was originally the Secretary of Education, and also found out she has cancer at the start of the episode. Gaius Baltar – James Callis plays an awesome anti-hero. Gaius Baltar is the scientist who unknowingly gave over the security information to the Cylons since he was sleeping with a Cylon Six model. You see his selfishness of the bat in that he cheats on her and is watching interviews of himself and when the bombs fall he is first thinking how not to take responsibility…but than we see him use his information via Head Six (A Six living inside his mind) to reveal who the Cylon Mole is on the ship. He also sticks up for an older lady when he could have taken her ticket given his past actions. His most telling statement is at the end. “I am on no one’s side.” This is his anti-hero character for a lot of the series, which gives him lots of room to grow. His character arc is what makes him one of my favorite characters, and the awkwardness of how Callis plays him. Lee “Apollo” Adama – Has a thing for Starbuck, blames his dad for his brother’s death and his brother was married to Starbuck. His life is complicated. He is the idealist though and it shines through and also the one whose goal seems to be to get out of his father’s shadow and make his own path. We see this in how he advocates for government and Roslin to be respected and his confronting of his dad. For him the big thing was finding out Starbuck was the one who passed his brother when he should have failed, throwing their complicated friendship into jeopardy, just as he is beginning to heal with his dad. Jamie Bamber does great. Kara “Starbuck” Thrace – She is the arrogant fighter pilot who truly is the best at what she does. She doesn’t put up with crap (largely from the drunk XO Tigh) and is willing to risk her life at the drop of a hat for others. She also has a lot of baggage via helping her lover pass flight school when he was unqualified and the fact that she loved his brother Lee. Her story is fascinating and I can’t wait to write more about it when I review more of the series later. Katie Sackhoff became unforgettable in this role. Caprica Six / Head Six – They are two different characters but the same actress Tricia Helfer. Caprica Six loves Baltar even though he doesn’t love her and saves him when the apocalypse comes. Head Six could be Angel, Demon or Hallucination is what is implied at this point and has a mental and sexual relationship with Baltar. She guides and manipulates his actions for his and her gain. Both are great characters. Sharon “Boomer” Valerii – Played by Grace Park, she is the one who is a bit of a rookie and the main savior of a lot of the people as she helps President Roslin when they meet up with her and the fleet later on. She is stubborn and quick to anger and also in love with Chief Tyrol. They have a secret relationship and a great dynamic as they play fight. She is great as the officer who finds her footing. Also, she’s a Cylon who doesn’t know she is. We see another model of her at the end of the episode in the Cylon Meet up. Chief Tyrol – Major feeler type He is the guy who you see in his face when he loses crewmembers to a Cylon Nuke and the desperation of survival. He is good at his job and very no-nonsense. His relationship to Sharon also feels real. Karl “Helo” Agathon – Helo is the guy who makes the noble sacrifice on Caprica. He gives up his seat for Baltar so that the human race will have a better chance at survival. He is also the one who helps Sharon find her cool. Tahmoh does great and I can see why fan reaction brought him back when he was supposed to die this episode. Gaeta, Dee and Billy – These three are very minor characters at this point but good in what they do. They give us glimpses of humanity. Gaeta is the one who idealizes leaders like Baltar and Adama and with it has hope, Dee is the one who has lost but sees hope in relationship via Billy and through Billy we see the loss on his face and him trying to work as his family was destroyed in one of the colonies. Billy is Roslin’s aide and they have some good moments. Leobon and Doral – Doral is the everyday press mole who poses the dilemma of imprisonment without evidence and Leobon is the fanatic who nearly kills Adama. He is the religious fanatic to the Cylon Cause that we see outside of Six. We see them at the end with a Sharon and Six too in the military base that the Colonials had escaped to temporarily before jumping into deep space. The Choices – Should one stay to try and save all when the chance of annihilation of all is at hand? Should people be imprisoned without evidence if they are suspect in a war of annihilation? What people should be saved when facing extinction? What is a just war? These are all the questions and choices faced in the episode and part of what makes this such a great series, beyond all the characters. This is one of the best if not the best pilot of a tv series I have ever seen. I can’t recommend it enough. If you like character dramas, moral dilemmas, politics and war this is definitely your show and this episode is a great introduction. Can’t wait till when I do a look back and review the rest of the series. Final score for this episode is 10 / 10. One of the best sci. fi. and television show pilots I’ve ever seen.